The Five of Disks. Worry. Rejection. Hard Times. Ill Health. Instability. Strain. Inaction. Helplessness. Despair. The Five of Disks corresponds to the Sefirot of Gebyuah: Motion that upsets the balance. Geburah as a Sefirot represents instability, and the Suit of Disks at its best represents stability. As such, the Five of Disks is the unstable aspect of stability; essentially, it represents the effects of one’s stability being taken away from them. It is the energy associated with being thrown out of the Fortress of the Four of Disks; a physical movement with dire consequences. Without the protection and defense of Power, one is Helpless; they have fallen on Hard Times and may be suffering from some form of Ill Health. After being Rejected by the Fortress, your life becomes Unstable, and a lot of Strain is put on your life. You may be paralyzed by Inaction. This card, essentially, represents one’s life without any support and stability; this is the card of the lame beggar. 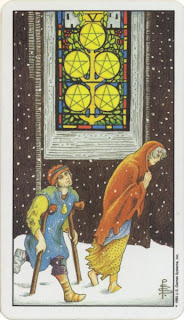 Indeed, the Rider-Waite art depicts a lame man and old woman out in the snow, outside the lighted windows of the Church; they have been Rejected and are clearly suffering from Ill Health and Hard Times. The Thoth illustration shows five large, heavy, dark Disks bound together by strings in the shape of an inverted pentacle, indicating Instability, which is the primary emphasis of this card. The arrangement of Disks seems to be precariously dangling over a pool of lava, giving a sense of constant danger and therefore Strain. In a reading, the Five of Disks asks you to examine the roles that helplessness, rejection, and rough times may have in your life. Have you been down on your luck lately? Felt powerless? Were rejected by friends or family? Given in to a sense of despair? Reversed, this card’s energies are blocked, hidden, or twisted somehow; maybe you are not as helpless as you appear, or your powerful position masks the inability to make choices (such as Londo Mollari’s comment inBabylon 5: “And now I have all the power I could ever want and no choices at all”).